Jewish Family and Children’s Service of Greater Philadelphia provides a full range of care management services—and financial support is a component. 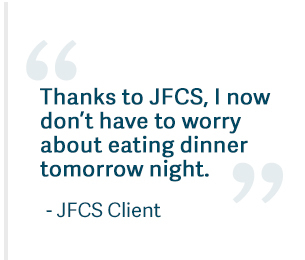 Our goal is always to help our clients become financially stable and self-sufficient. Knowing that needs will be met is satisfying, both emotionally and physically. Our thoughtful and comprehensive approach includes several phases. We take a comprehensive look at a client’s financial situation, including an income and expense analysis; we identify community and public benefits that may be applicable. We create a plan for the individual, developing a budget with specific recommendations on how to maximize income and decrease expenses. We develop an ongoing relationship with clients and regularly re-evaluate their progress.